Welcome to TwinklensArt's Blog. I'm a digital artist who enjoys 3D modeling, photography art, and digital painting. 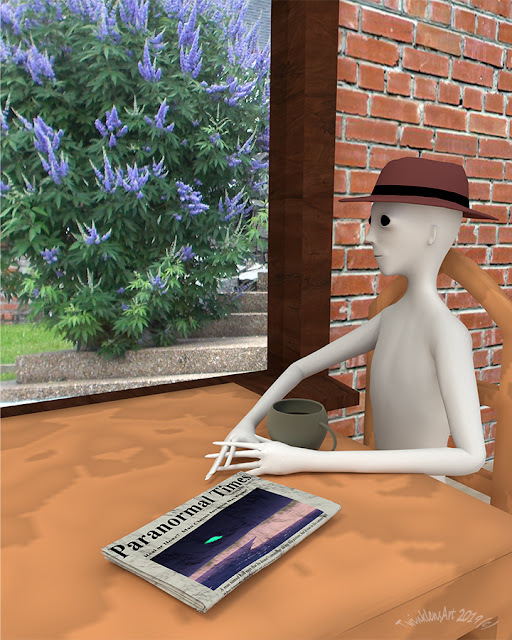 Also, I may muse over my life in the metaverse in Opensim, or trials of a newbie with Unity. Once again, its been awhile since my last post. Some things do stay the same. Between then and now, I changed computers, and more drastically changed from Apple to PC. I thought long and hard about this, agonized a bit really. I have had an Apple since the mid 90s, and was very comfortable with the familiar platform. But, things change and I needed a stronger GPU. I switched after deciding that a tool is just a tool, and I could buy 3 pcs for the price of one regular imac, not even the pro. I chose a gaming pc, the Acer Predator 500, a 17" laptop (the portability was a factor this time), chosing it for the power that Blender needs for good rendering. It is fast! I'm impressed. And, I will get used to Windows again. Luckily, I have a wonderful friend who has guided me a bit in configuring it to my needs. That saved me so much research and fumbling time! Mr. Gray in a cafe. This took about 20 minutes to render an 8x10 at 500 samples. It took my old gpu around 3 hours, for just the character alone. And because this laptop isn't thin(its big and hefty and I could probably gain some muscle tone by lifting it up and down like a barbell) there was no heating up. So, that's fun! I can create more and save time, and start exploring Blender 2.8's eevee. ©2019 TwinklensArt All rights reserved . Awesome Inc. theme. Powered by Blogger.